Pro life campaigners gathered outside Our Lady Of Lourdes Hospital in Drogheda today. (Left to right): Brian Ó Caithnia, Sandra Clonan and Charles Byrne. FOR AT LEAST the second time this year, anti-abortion campaigners protested outside of Our Lady of Lourdes Hospital in Drogheda, Co Louth. One of the three people who took part this morning was Charles Byrne, who said he was there because the group had received information that a number of terminations were to take place in the hospital. “We received reliable information that there were two abortions taking place in the hospital today so our purpose is to have a prayerful, peaceful presence to remember that baby and to honour their lives however short they might be,” he said. Byrne said that he had heard that abortion services take place in the hospital on particular days, with consultations and procedures happening on separate days of the week. You get some texts but we do have people kind of on the grapevine. He said he did not want to name anyone who was providing information. I don’t want to get anyone in trouble. Byrne was one of a number of people who took a legal challenge against the outcome of the referendum on the Eighth Amendment last year. He also took part in a similar protest outside the hospital last month after it was claimed on social media that the first abortion was scheduled to take place there. I didn’t enquire into those kind of things. We are not trying to pry into the individual cases. He said that any time there was an abortion his group believed it was “a tragedy”. “We are not here to judge the woman but the action itself is a heinous crime and we stand for those babies,” Byrne said. TheJournal.ie reported yesterday that a number of investigations were underway following allegations that a patient’s medical and personal details were leaked after she had a termination at the National Maternity Hospital, Holles Street (NMH), in Dublin this week. The HSE, the Dublin Well Woman Clinic, the NMH, the Data Protection Commissioner and gardaí are making inquiries about the alleged incident. There are concerns that the patient’s details were shared with a rogue “abortion counselling service” agency that the HSE has warned against. The HSE launched its probe into the incident following a request from the Health Minister Simon Harris. Through a spokesperson, he said he was concerned by the allegations raised on social media. Byrne was today with another man and one woman who stood at the Windmill Road entrance to the hospital from 7am to 10am. Babies are God’s property, destroy them at your peril. 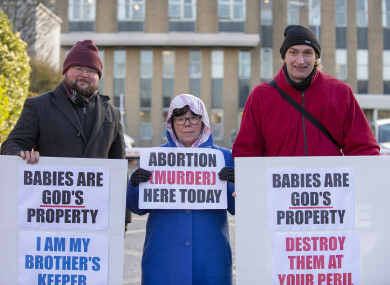 The other man, Brian Ó Caithnia, said he was there to “just to be part of this presence, this witness, that we know that abortion is a tragedy, and that there is always a better option, and we don’t want our country ending up like other countries that have gone down this road”. He said that some staff were supportive of them including a woman, he believed was a nurse. Byrne said that the woman had said “keep it up” as she passed them by. “People think that just because something is law we just have to follow the law now and it is like a new morality, as if something was wrong yesterday and now it is right,” Byrne added. We never ask about patients in particular, we have never enquired into personal details. The only thing we would be interested in is if there is actually an abortion taking place. A woman, who is an in-patient at the hospital, said she supported what they were doing. “Fair play to them, I class this hospital as a first degree murder hospital,” she said. I agree with what they stand for. I agree all human life is sacred. “The DPC is aware through media coverage of issues arising from a possible breach of patient data. We are currently making enquiries into the matters reported and once further information is available will decide on the appropriate action to take. The DPC has no further comment at this time. The gardaí when asked if they were investigating any alleged breach of data or leak of information regarding Our Lady of Lourdes Hospital said they had received no reports. Email “Anti-abortion protesters say they received 'reliable information' on abortions taking place in Drogheda hospital”. Feedback on “Anti-abortion protesters say they received 'reliable information' on abortions taking place in Drogheda hospital”.